With the recent passing of the Bee Gees’ Robin Gibb and iconic disco queen Donna Summer, I find myself in a retro sort of mood. I have been listening to a lot of music from the 60s and 70s the past few weeks. I have a whole “British Invasion” playlist on my iPod that includes a lot of Beatles music. John Lennon’s “Give Peace a Chance” somehow played twice in a row, and I took it as a sign (a peace sign?) that I should pay homage to the era. So tuck a flower in your hair, put on your mood ring, slip into your bell bottoms, and get ready for a hip and very colorful retro tablescape!!! Bright hot pink flatware from TJ Maxx is positioned to resemble a peace sign. 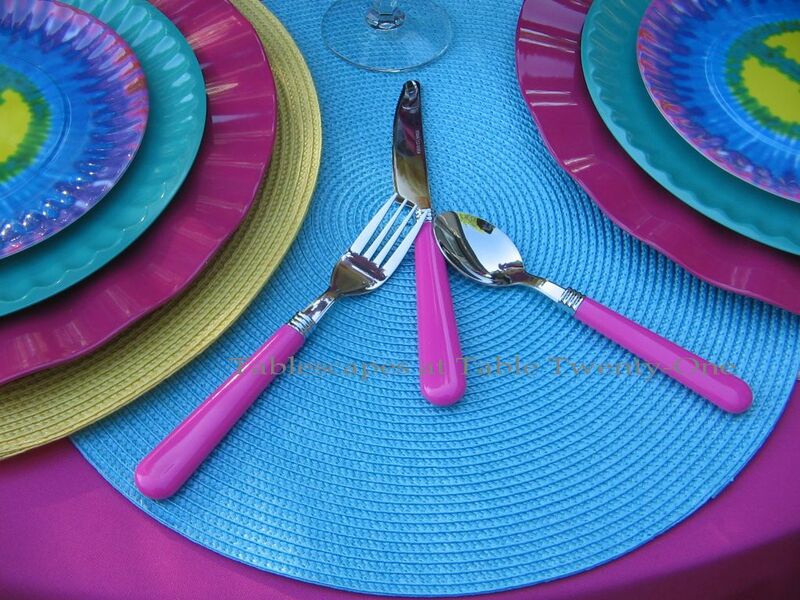 The color really resonates against the aqua blue of the placemat! Right on!!! You might think I’m totally zonked and trippin’ to imagine this, but I actually thought that this so-called “bunny ears napkin fold” looked a lot like a peace sign! Work with me, people! Look at the hot pink napkins folded and secured with a Bed Bath & Beyond daisy napkin ring (to soothe your inner flower child!) and tucked into the simple clear glass stemware. Tell me that doesn’t look like the fun resin peace sign here from Home Decorators Collection!!! I created the look of the mega-sized hoop earrings of the era using floral wire spray painted gold and formed into a circle around a coffee can. More flower power with this vase of oversized faux Gerbera daisies! Can you dig it? Did I blow your mind? This setting would be great to celebrate the birthday party of someone born in the 60s or turning 60! Jet on over with me to Susan’s crib anytime after 9:00 Central Time this Thursday to let it all hang out with some other really far out chicks & dudes for Tablescape Thursday. It’ll be a gas, man! Far out man. 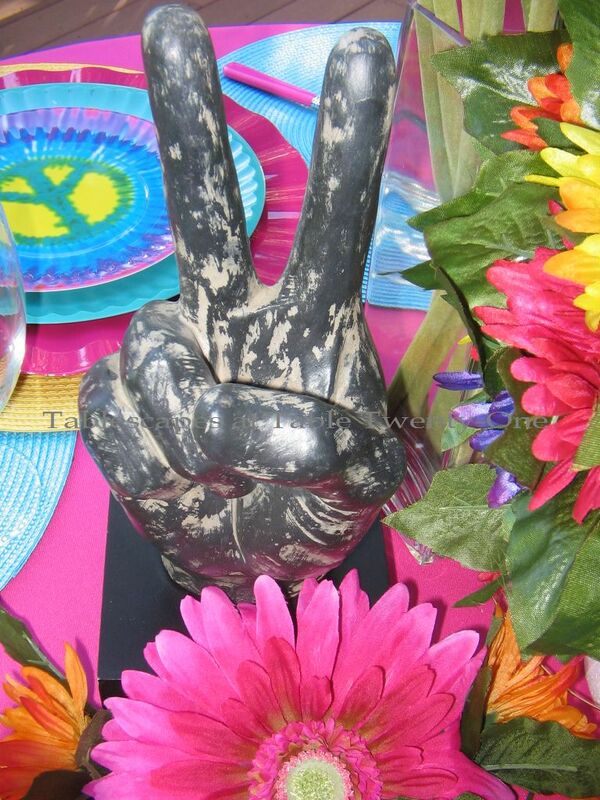 This tablescape is like groovy and so peace, love and flowers everywhere. I love daisies. Where did I put my tie die t-shirt and bell bottoms? Once again, you did a fabulous job with your chosen theme. Stay cool. Peace. Hey Dudette, far out! Like Groovy sister. I love this! How fun is this colorful table and also brings back memories. You have really celebrated the 60’s. This looks like it was a lot of fun putting everything together. Brought back some memories. Of all of your creative masterpieces, this is far and away the most FUN. I love the colors and the use of the flowers and the peace signs. I didn’t see the napkin in the glass one at first glance, but after you pointed it out, you are DEFINITELY not trippin’… It looks perfect, especially with the flower. My favorite part of all is the styrofoam head with the sunglasses and daisies. You crack me up! That was just perfect. Really and truly, this is one of my favorite “21” tables. So clever!! Alycia this table is so right on I can’t believe it. 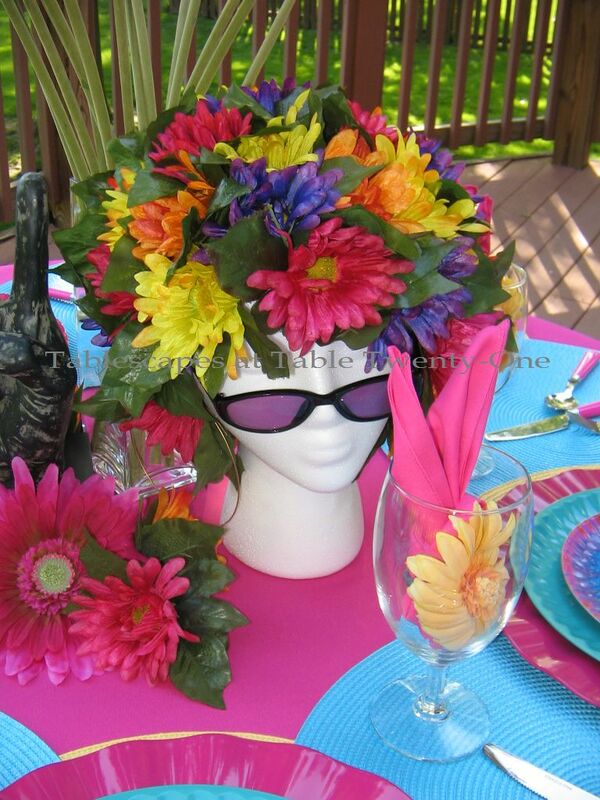 The colors and peace plates and flowers with napkins the head, glasses and flowers. Girlfriend you didn’t miss a beat. Love it all. This is one of my fav’s of all your fab tables. Your fun personality just shines through. Tell me should we wear a tie dyed TShirt to your soiree?….I definitely don’t want to miss this one!!! Alycia…I am imagining you setting the table wearing your bell bottoms, your round glasses and tie dyed shirt..singing “all you need is love”…. 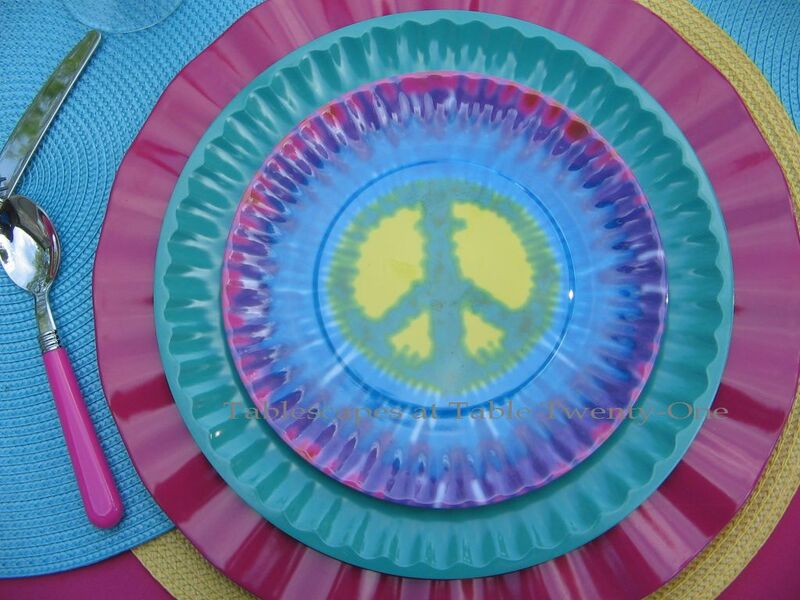 I cannot believe you found those great peace sign plates….This table setting is wonderful…it would make a great setting for a birthday party of a child from the 60’s….I so love it!! !….Your table belongs in the fields of Woodstock! Groovy man ! Love it ! Wow Girl! This is sooo cool! You know man… it’s like more then trippin man,… it’s far out! You certainly pulled this one together well. Love the head full of flowers with glasses. It’s all so Groovy! My gosh this takes me back…… love the vibrant colors! Wow you even still had the lingo down pat from the 60s and a perfect table and decor to reflect the era. I was in high school in mid to late 60s so remember it all well. 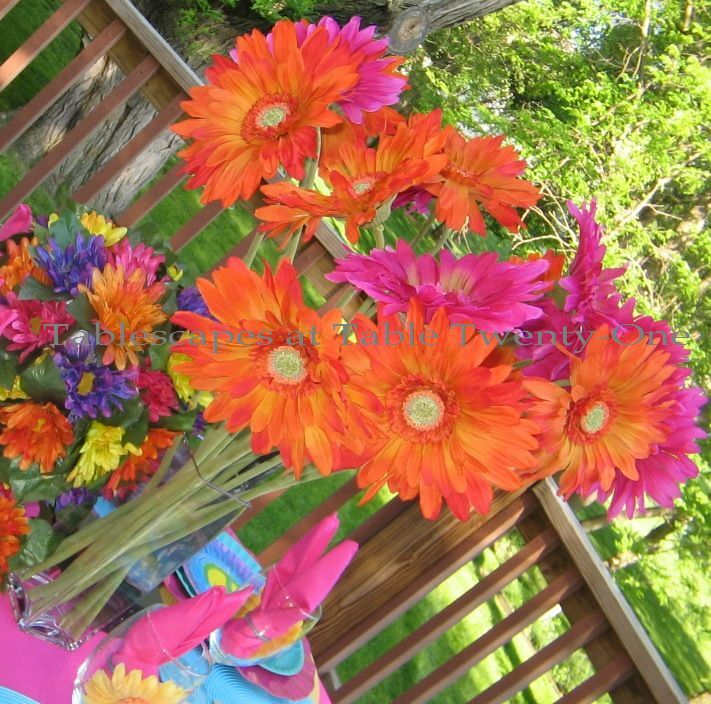 The hot pink and turquoise with orange daisies were a vibrant combination for the table. Love the flatware too, I must have missed those at TJMaxx. I went to college in the Fall of 68 so remember seeing peace signs everywhere, your table sure has those memories flooding in right now. thanks for a great table and old memories. I loe this, Alycia. Where on earth did you get those peace plates? The table is so hip and psychedelic.It’s my era or sure. PEACE! Like, man I am diggin’ it!! Soooo groovy!! I danced a million miles to Robin Gibb and Donna Summer!! Your psychedelic momma is just the coolest!! I don’t think I would have thought to add the earrings or the flower hair!! Love the peace sign hand and the peace plates. I’m showing this to my kids, they will get a kick out of it!! It definitely makes me smile!! That table is so cool. Love the way you have displayed the cutlery. And your flower power girl is so cute. Right on, right on, right on!! Love it! Those flowers in the vase are perfect for this retro look! They really help make it look perfect! Those peace plates are too cute! All the bright pinks, oranges, greens, yellows are so perfect! I had a bedroom with hot pink walls, a pink and green flowered bedspread as well as black light posters!! So cool, man! The colors are retro and are still going strong. Love the color scheme. The peace hand and the daisy afro are super. Thanks for sharing. Oh, I love this! Far out, for sure! You are so gifted and groovy. I thought the napkins were peace signs before I read it, so you succeeded with that idea. Love the collage. wow! Flower power… Peace to all mankind. Love the neon color. It looks so me. Retro-ing the setting is an absolutely gesture of our younger years. Ahhh… who forget those beautiful peaceful days. Love this setting so much. Girl, you absolutely “crack” me up. Is there no end to the talent you have for putting a table together? Talk about flower power, peace signs to say nothing of the Marilyn Monroe moment, girl you rock!! You can’t go wrong listening to 60’s music, I remember my brother playing it all the time. I can only imagine the conversation going on over this flower powered table. I love all of the bright colors and that little Flower lady in the center…totally awesome! I love how you overlapped the placemats, too…ways to add more layers of color…genius! Fantastic tablescape! You didn’t forget a thing! Love the colors and the peace sign plate! 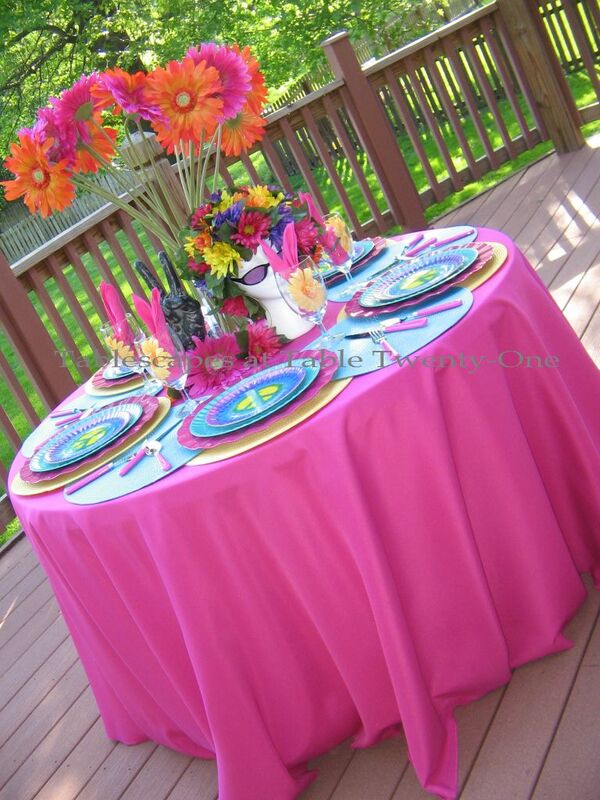 I love this fun and colorful tablescape! All set ups were all great! Thanks for spreading this excellent ideas! Thumbs up! I’m diggin’ this groovy retro scene, man. Like far out! LOL, This is sooo much fun. I remember Goldie Hawn on Laugh In. Loved that program. Great theme and GREAT party decor! Love it Alycia. 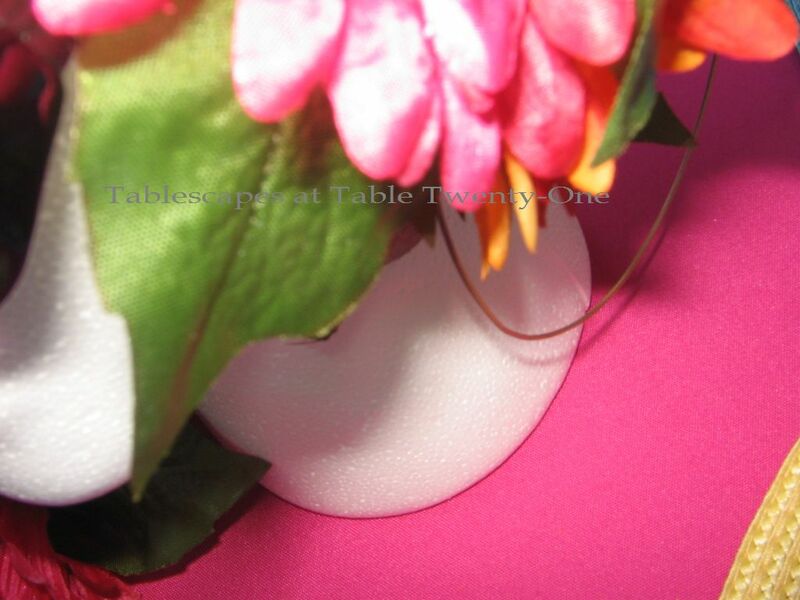 Your Tablescape is Beautiful with all the colors it just pop.!! and you did a great job putting this all together for your party. I hope you have a wonderful week with your family. This is so beautiful. My daughter would love it. She had one of those “peace” salad plates from hobby lobby, but it got broken last night. If you still have these plates, would you be willing to sell them to me? Hi..I just found your site….WOW!!! Love your ideas. Any chance you would want to sell the “peace” plates. Or rent them for use? 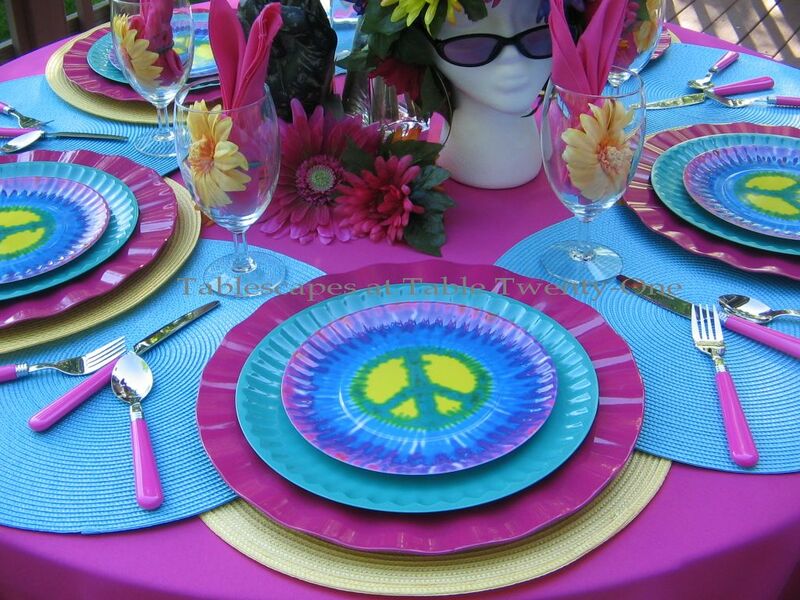 I do a fundraiser call “Festival of Tables” and I want to do a ’60’s themed table. All the monies from the fundraiser are donated to our local hospital. I would gladly borrow or rent or buy if you are wanting to sell those peace lov’n plates.